Leave that Window Hummingbird Feeder Up! The fall hummingbird migration still has feeders popping! With most of the male Ruby Throats already in tow, females and babies are seeing less competition for nectar. They’re looking a bit plumper too as they prepare for the southward journey. It’s pretty wild that even juveniles who’ve never made the trip, instinctively know to move south for winter – because they don’t follow mama and they don’t fly in flocks! The dwindling hours of daylight is their signal. Nectar can be a little stronger this time of year as extra calories serve the birds well… they’re literally on a mission! So leave your window hummingbird feeder up, even if you don’t see anymore birds at the moment. Stragglers from the north may find an oasis at your place if fresh food is available for re-fueling. To get an idea of the September-October migration, head on over to fall hummingbird migration (learner.org) and click the map to left. You can even submit your own comments about hummingbird activity at your place. Considered Citizen Science, the data greatly helps in tracking the tiny sprite’s movement. If by chance you have a basin style window feeder, consider using it year-round for resident birds. Not filled with nectar, but mealworms, shelled peanuts, suet crumbles or similar. Remove the lid and your left with an ideal feeding tray! Above all, leave at least one hummingbird feeder up for stragglers. There’s even documentation that some hummers stay year-round… in NC and even further north in MA. It’s a total myth that leaving feeders up will keep the birds from leaving… Mother Nature provides them with keen instincts far and beyond that of any two-legged creature! What’s Really in Your Window Hummingbird Feeder? One of the biggest myths about feeding hummingbirds is their food needs to be red. That one, along with leaving feeders up in fall will deter the birds from migrating. Neither are true, and the former may actually be hazardous to the tiny sprite’s health. Although no formal studies have been done to prove red dye #40 is not safe for hummingbirds… none have been conducted to say that it’s safe either! We’ve been encouraging folks to make their own nectar for years. Not only extremely economical, we believe hummingbirds prefer the home made solution over commercial mixes. 1 cup of sugar to 4 cups of water… it couldn’t be simpler! Should you have any doubts or fears upon taking this leap from store-bought to home made, check out the new Nectar Aid. It’s the absolute easiest (and foolproof) way to make your own hummingbird or oriole nectar. Measure, mix and store it using one container, even the stirrer’s included! Check out the demo video below, then watch some tiny sprites in action at this fun window hummingbird feeder! The southern trek approaches and hummingbirds instinctively know to fuel up for the long journey. As daylight hours become shorter, all migratory birds are preparing for their long flights south. Because hummingbirds are so territorial, they seem to spend more time fussing over (defending) their claimed feeders than actually eating. This time of year can be a trip if you really observe the tiny sprites. Adding an extra feeder is most helpful, if you can add two… even better. 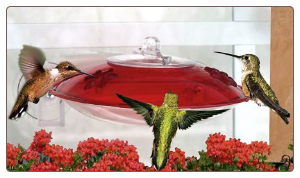 Consider a window hummingbird feeder, or at least placing one of them within view from inside your home. It’s an ideal way to catch small glimpses of action here and there while going about your daily routine. If we could sit on the deck all day and just watch… many of us would, the sprites are that mesmerizing. Migration is a frenzied time around feeders. 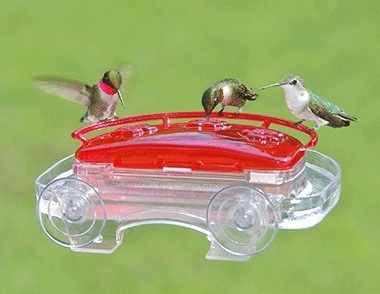 In the Eastern part of the country, male Ruby Throats begin their journey first. So aggressive around feeders, it seems their lives depend on that nectar. Females and juveniles follow, but you’ll never see them in groups or flocks because they fly solo. Even first-timers follow the instinct Mother Nature gave them to fuel up and find better digs for winter. Some land in Mexico for the season, while others journey further to Central and South America. Nectar solutions can be a little stronger now as some recommend changing the ratio from the standard 1:4 to 1:3. One cup table sugar to three cups of water. The extra calories serve hummingbirds well in their quest to fatten up. It’s also the optimal time for a swing! Say what? A hummingbird swing… really! Have you ever seen them? They’re hanging perches for the birds to rest while guarding their feeder. When we first installed ours, it seemed so-so, not a whole lot of action. But once the big migration was under way… omg, what a hoot! It’s the original, it’s Pop’s Hummingbird Swing and here’s the real story – enjoy! It was actually snowing today, after 3 days of spring-like 70 degree temperatures, on March 25 there were flurries in Atlanta! Will winter ever end? Migratory birds are already arriving, making their way northward from the gulf. It’s got to be a trying journey as the landscape lacks their usual finds. They’re already hungry, tired and now… there’s no food! 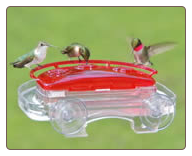 Feeders help them on their way; seed feeders, suet feeders, fruit feeders, even your window hummingbird feeder. The same tiny sprites are likely to return to your yard if it offered good digs last season. It’s called site fidelity and hummingbirds practice this ritual. 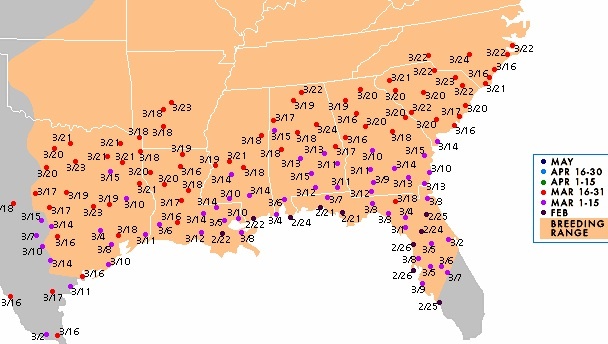 The map over at hummingbirds.net shows daily sightings and locations for Ruby-Throated Hummingbirds. They’re penetrating the southeast and moving into Kentucky now. Just because it’s still cold outside it doesn’t prevent Mother Nature’s instincts from kicking into full swing! Longer daylight hours are pushing birds north to spring breeding grounds. .. despite cold weather. Although it may not seem like hummingbird season is here – it is! Definitely time to dig out those feeders for a good cleaning and get them filled. Nectar can even be mixed a bit stronger than usual during migrations. 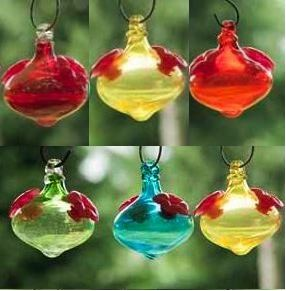 Your hummingbird feeder will prove to be a most welcome sight for the hungry and tired little birds. And hey, if you’re lucky enough they may even just stick around your place for the breeding season! The busy hummingbird season’s winding down, and all of a sudden you’ve got ants who’ve discovered the nectar… yuck! Hummingbirds won’t drink (or prefer not to) from feeders with ants or bees, or any insects in their nectar – just doesn’t taste too good. If buying an ant moat this late in the season isn’t so appealing to you, there’s an easy way to get around the pests in your nectar! Vaseline! Yes a dab of petroleum jelly around the hanger will thwart ant’s passage. If your feeder hangs in direct sunlight (which really isn’t the best location) just try to be sure that if the gooey stuff melts-it doesn’t enter the feeder’s ports. As the one in charge of six hummingbird feeders at the stables, an even better alternative was discovered this year. It’s called Swat, and it’s purpose is to keep flies and gnats off horses’ wounds, out of their ears, or away from their eyes. There’s two kinds: original which is pink, and their newer version, which is clear, but like always… original is best due to the thicker consistency. They made it in clear because some folks don’t care for the “war paint” effect on their horse. Anyway… this stuff rocks as far as an ant moat! A dab around the hangers back in July… and it’s still working! And the cool deck-mount feeder above? Parasol stopped making it for this reason… ants and no way to use a moat. The Flower Box is still around (in lavender and green too) and the same principle applies with the Vaseline application. A dab around the hangers and back of the basket keeps this hummingbird feeder ant-free… sans the moat. 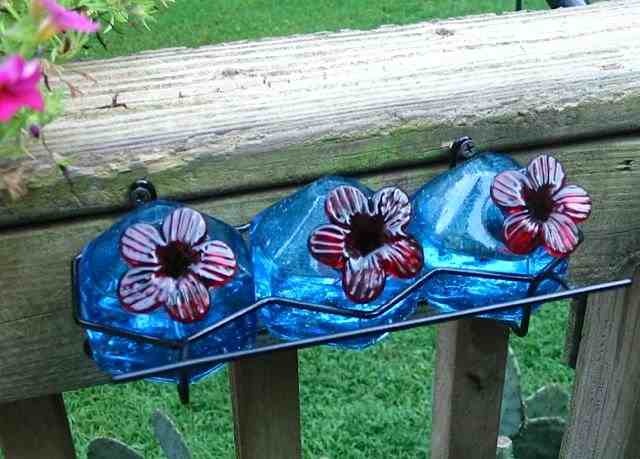 window hummingbird feeder trains sprites for hand feeding! Sometimes it’s the tiniest things that can bear the biggest impact. Hummingbirds for example, are the smallest of beaked migratory visitors, but their performances are anything but small in stature! Putting on some of the greatest shows with their expert acrobatics and natural antics, it’s no wonder these tiny sprites continue to mesmerize and endear so many people. Not too terribly shy either, once they become regulars at backyard fountains or feeders, and familiar with their hosts… they’ll buzz by so close you can feel the breeze from their speedy wings! 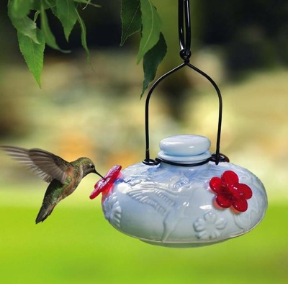 It happened just today… while changing nectar in the window hummingbird feeder – her swift movement caused a swooshing breeze and a bass-like buzz that went right by my head… it made for a pretty magical experience! 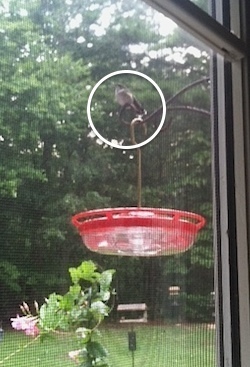 Oh, and the tiny tube feeder on the window? It’s actually part of set that lets you train hummingbirds to eat from your hand (well almost). The idea is once they get used to the tubes, you sit quietly holding the feeder by the copper wand and the sprites come right up and eat – within twelve or so inches from you. 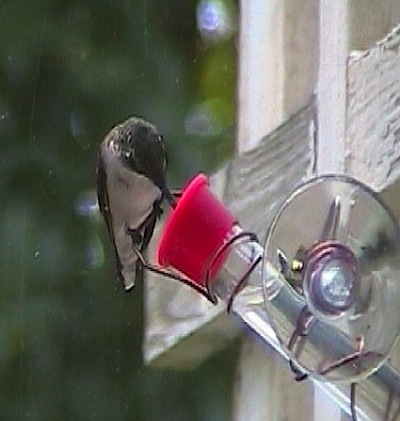 One feeder is staked to set in a flower pot or plant, the other a window feeder. It’s actually pretty cool, but does require a little bit of patience. Training time may vary depending on how well your hummingbirds know you. A tiny little feeder set for some tiny birds that promise to bring some big amazement to your world! 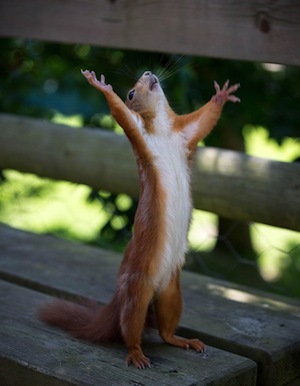 I think he’s celebrating, hallelujah… spring has sprung! The very first hummingbird was spotted today, bringing sheer delight in knowing they’re back. For the next six to seven months, sights and sounds around the yard will be a-brimming with silly antics and buzzing activity from these favorite migratory birds. Their very own Pop’s Hummingbird Swing was installed last season and it proved to be a huge hit, so we’ll likely add another this year. Although feeders are out, there aren’t any flowers yet from which to draw nectar, and that part’s kinda sad. Nothing’s been done in the yard as far as clean-up and planting colorful annuals for the season. Perennials have not started blooming except for the very early – and long gone crocus and jonquils. Some white candy tuft clumps perch upright in a barren looking landscape, while trees are just sprouting tender green foliage. Leaf misters (that never made it to storage last year) sit ready to spray, and the popular Hummer Helper nesting material is also ready for action! 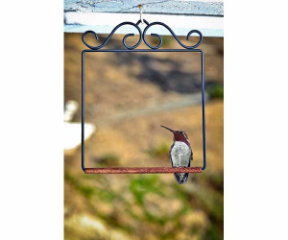 Because this one hangs from a sturdy window bracket, it serves as our window hummingbird feeder, and eyes are peeled when in the kitchen. So nice having a feeder right at the window again… and one that squirrels won’t bother with! Although the extra four feeders added for busy hummingbird migration weeks have come down and remain in storage until next September, one lonely feeder hangs. It’s an offering for passers-through, stragglers to refuel for their long road trip. There are still hummingbirds in parts further north who are their way to winter grounds. A pit stop to re-fuel greatly increases their chances of a successful journey! Nectar solution is made stronger this time of year, offering more calories. Because Calories=Energy. 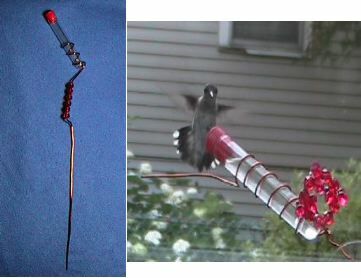 You can turn any hummingbird feeder (except really large capacity ones) into a window hummingbird feeder with sturdy hooks and window hangers. T he Great Hang-Up, shown here, accommodates up to three pounds… secure and safe! It’s perfect for smaller nectar feeders, and seed feeders too. Close up views of bird behavior are a big part of the whole backyard birding attraction. Watching behavior up close, lets you determine birds further off in the yard just by how they act, and this is great if you have poor eyesight and never wear your glasses! Plus having the freedom to change the feeder with seasons is also very cool. 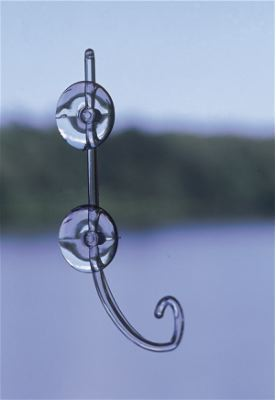 Switch it up and try a window hummingbird feeder next season, with hangers like these, the possibilities are endless. 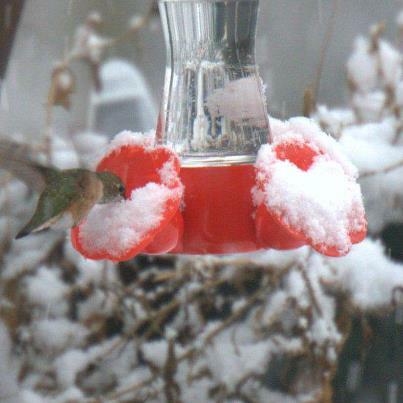 With the mild winter season across most of the country this year, it won’t be too long before the hummingbirds are back! Unlike any other songbirds, the tiny sprites are really in a class of their own. If you already have them around your place, then you know what I mean. If not, this is the year to feed, plant, and attract them to your yard. The rewards are mesmerizing and tenfold! And, no birdseed to buy… you can make your own nectar from plain table, or cane sugar (no substitutes) and water. To further entice hummingbirds to your window hummingbird feeder, moving water is always a huge attraction! Here are two other very cool accessories which promise to bring them buzzing! Check out Pop’s Hummingbird Swing and video below, and Hummer Helper Nest Material (endorsed by The hummingbird Society). 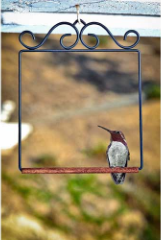 Place this simple but elegant Hummingbird Swing near your feeder and hummingbirds will use it as a territorial perch to watch over their food source. Tested and trusted, check out the video below. Swing, Eat, Chase away other hummingbirds.. repeat! Enjoy! 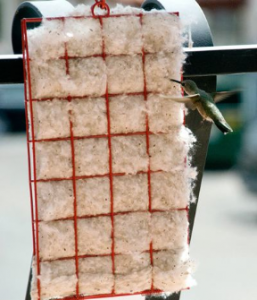 Hummer Helper Nest Material has actually been endorsed by The Hummingbird Society as being the only commercial nest material that will increase visits to your window hummingbird feeder. By encouraging nesting, juveniles will follow parents to the feeders, and if the habitat is right… those same hummers will return next season! Site fidelity plays a huge role in hummingbird migration, if they find a place they like, they return to that place year after year. Pretty cool, huh? It’s kind of bittersweet-the end of hummingbird season. When the beloved flying jewels have left for their winter homes, and all’s that’s left for us is cleaning and storing the feeders for next season. But it doesn’t have to be! 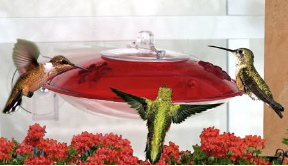 A basin style window hummingbird feeder can do double duty to serve your resident birds treats during the winter season. 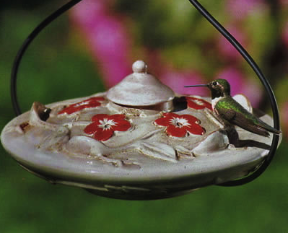 From seed mixes, or shelled peanuts, to suet chunks and even mealworms, window hummingbird feeders that feature a basin style can do a two-in-one. 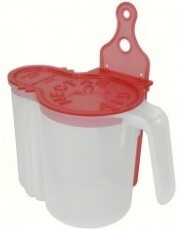 Lids remove easily, creating a window feeder for prefect close-up views. Your resident birds will thank you, especially during frigid weather. So instead of storing that window hummingbird feeder this year, be creative and offer feather friends another feeding spot… without the cost of a new feeder!